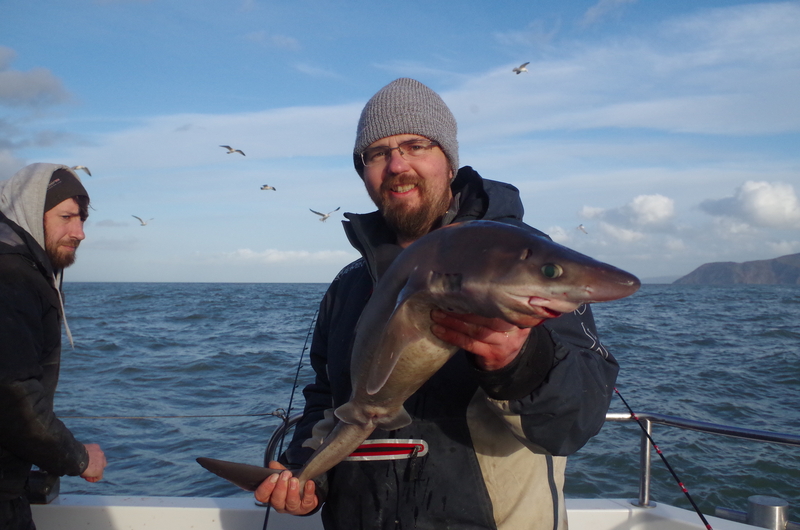 “So nice to get out again with so many cancelled trips this year, today was aboard Bluefin chasing Spurdogs. 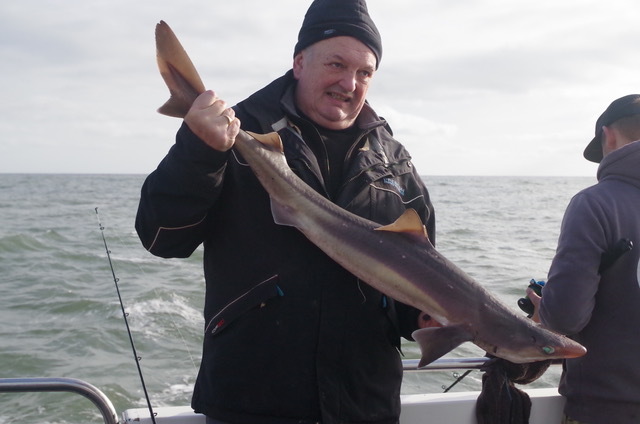 Not as prolific as they can be but we still managed several double figure fish. 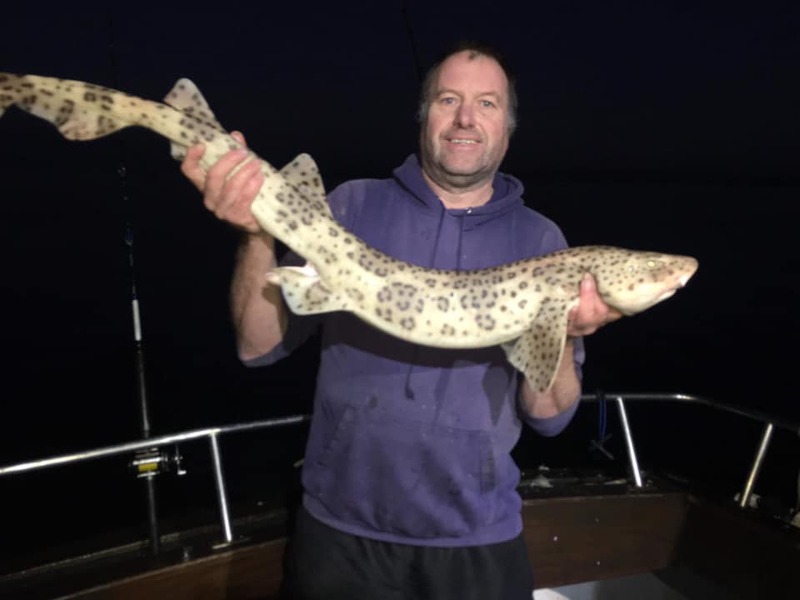 The Eels were a bit scarce and a few Huss turned up but my fish of the trip was a lovely Starry Smoothound right at the death. 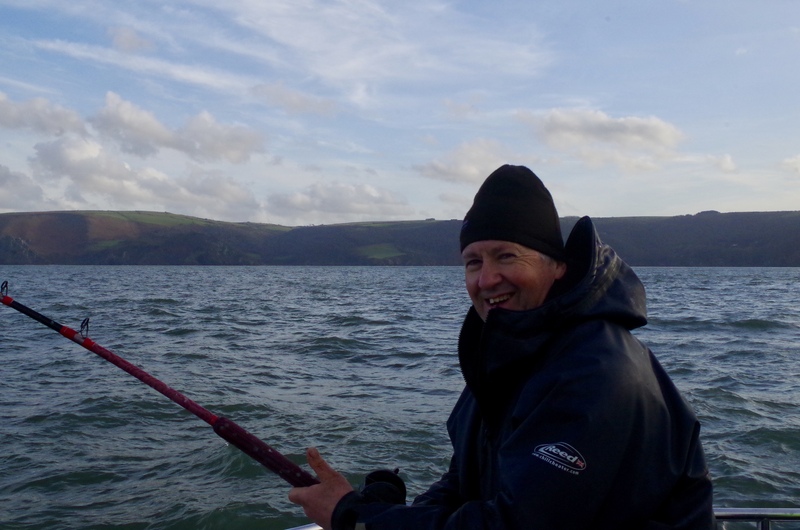 Great company Chris Hodgson, Steven McDonald and as usual John delivered some great skippering. 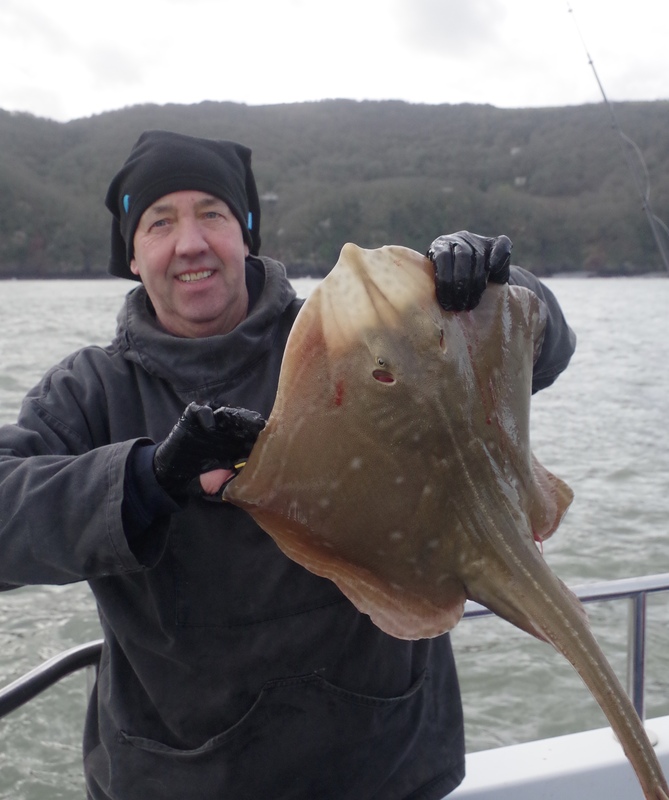 Next week we are back out from Ilfracombe on Bluefin with Holsworthy Sea Anglers. 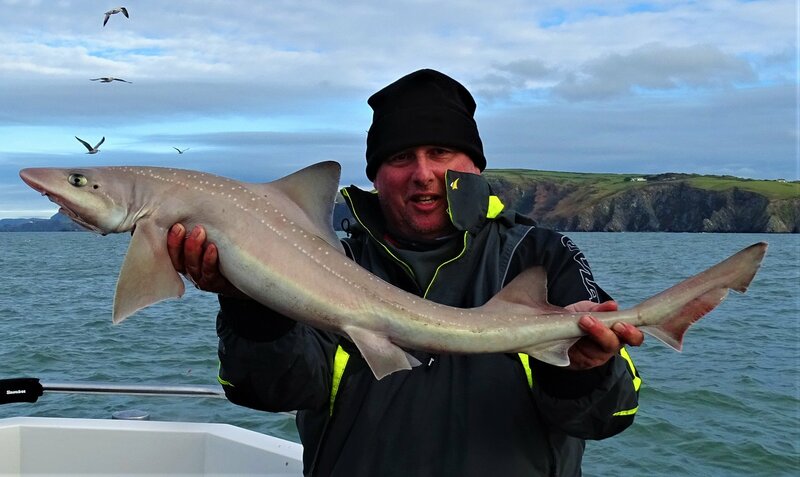 I joined seven fellow members of Combe Martin Sea Angling Club aboard Ilfracombe Charter Boat Wild Frontier Two skippered by Mark Hutchings. 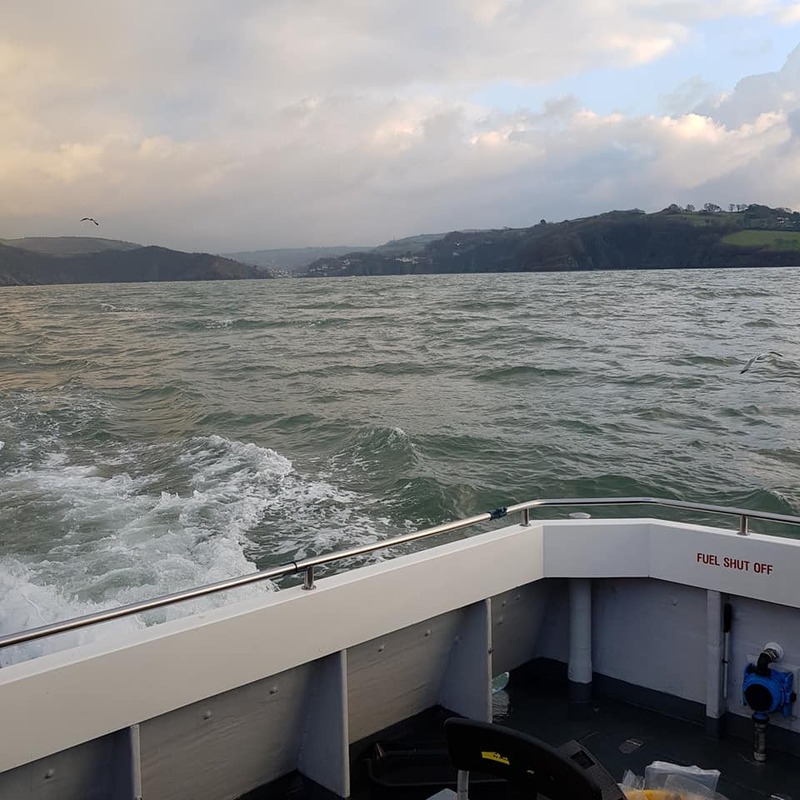 With a brisk South West Wind forecast and a substantial swell surging onto the coast I was a little apprehensive regarding the day ahead as we climbed aboard. 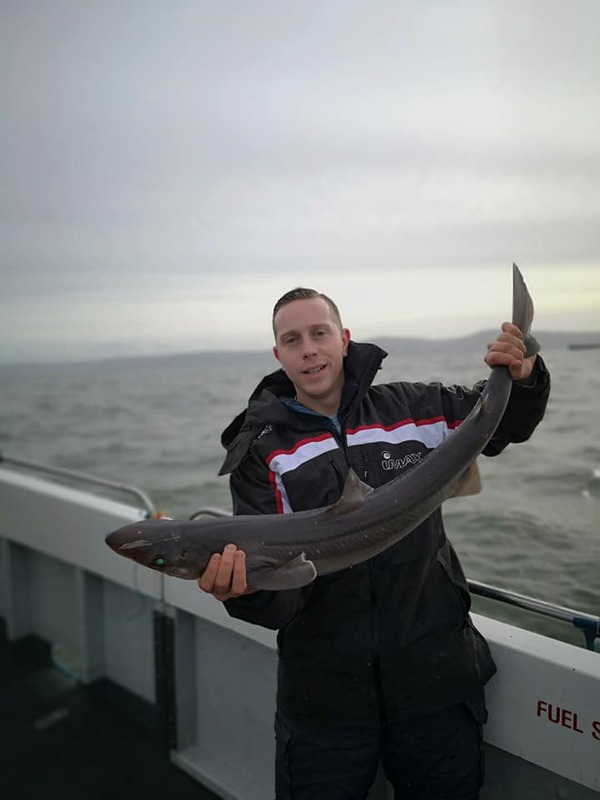 Any fears soon evaporated however as we steamed out of the harbour appreciating the stability of the broad decks of the catamaran that gave plenty of room for all anglers on board. 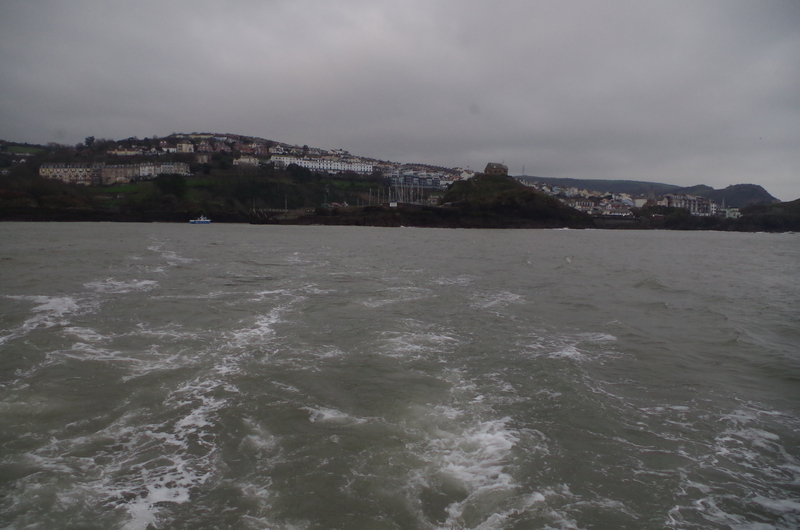 Heading up channel we all gazed at the towering cliffs East of Combe Martin that are I believe amongst the highest sea cliffs in the UK. 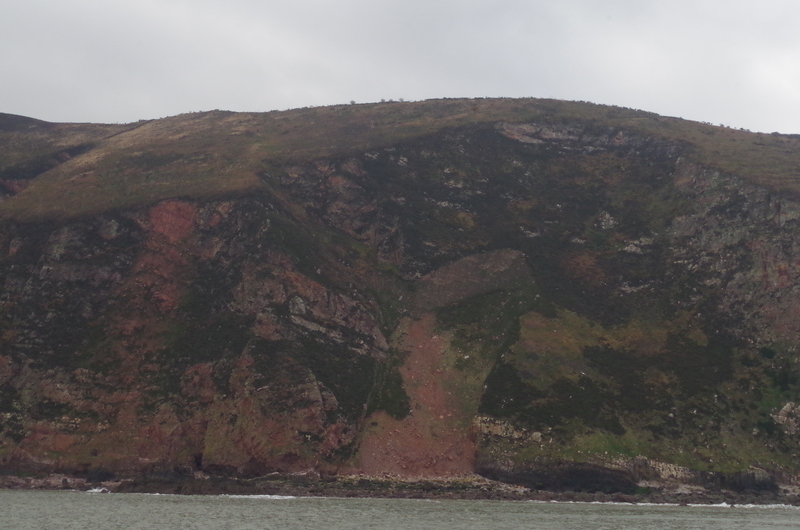 It was apparent that the recent weather has impacted on these wild and rugged cliffs with plenty of scars indicating recent rockfalls. 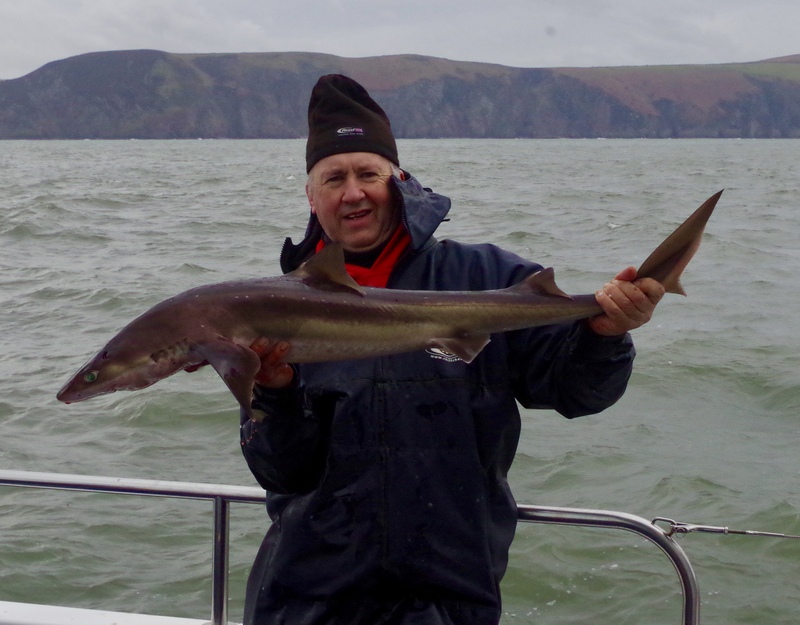 Our first stop in the lee of these cliffs brought only limited action with just a few dogfish grabbing our baits. 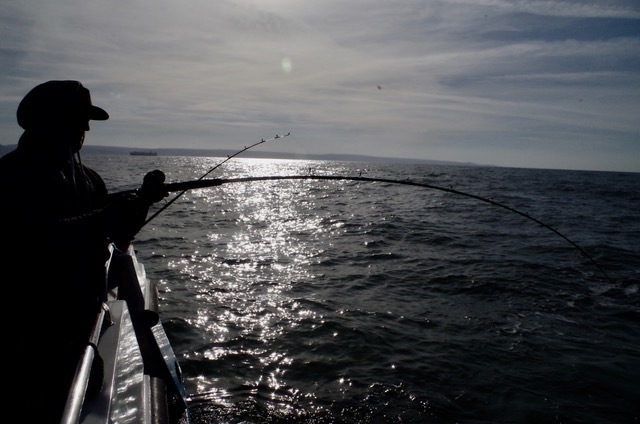 A strong wind made fishing difficult at times causing the boat to swing on its anchor as it swirled with gusts riffling the sea as they sped towards us. 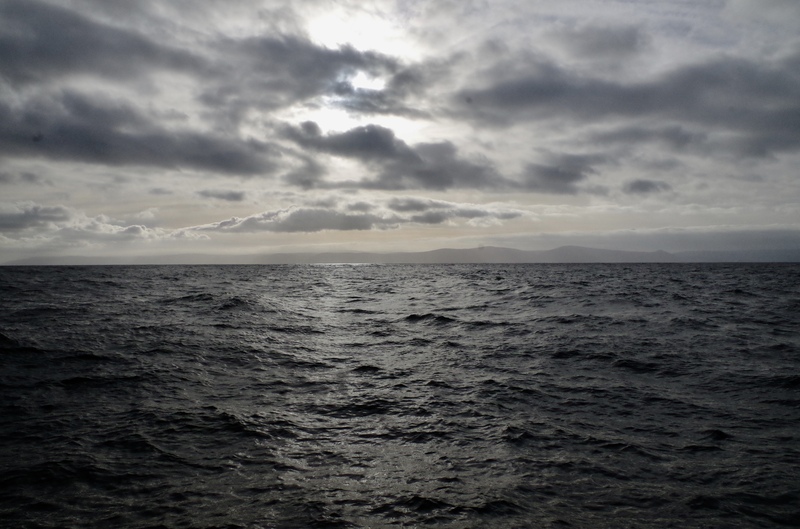 The sound of the mighty swell pounding the foot of the cliffs provided a dramatic soundtrack as we savoured a hot drink whilst watching nature acting out its daily drama. 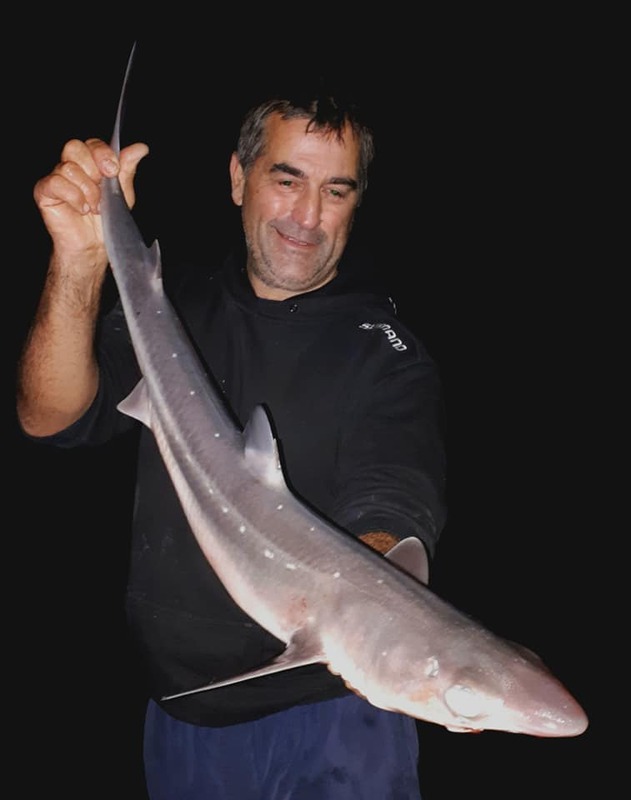 The easing tide signalled time to head out deep to target the spurdog packs. 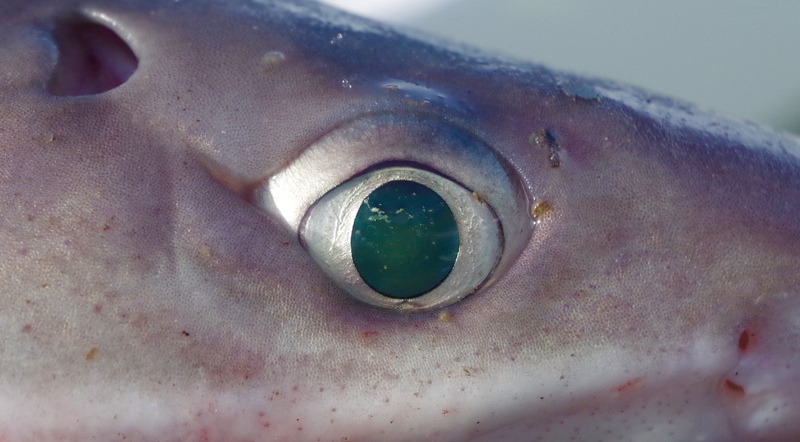 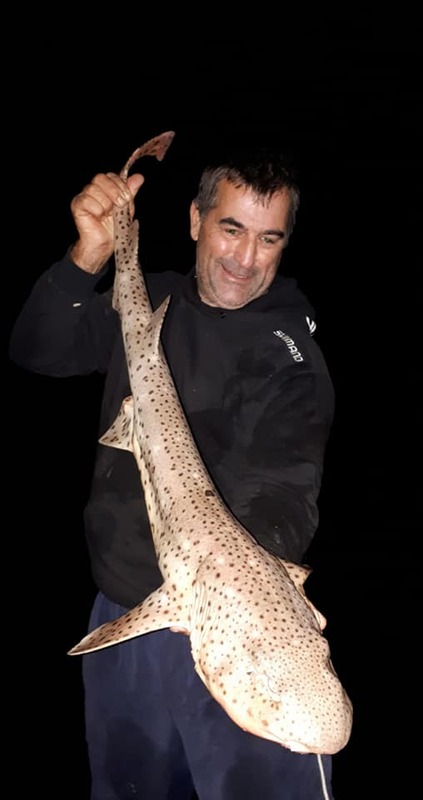 We lowered our baits into deep-waters and soon started to get savage indications as hungry spurdog seized our offerings. 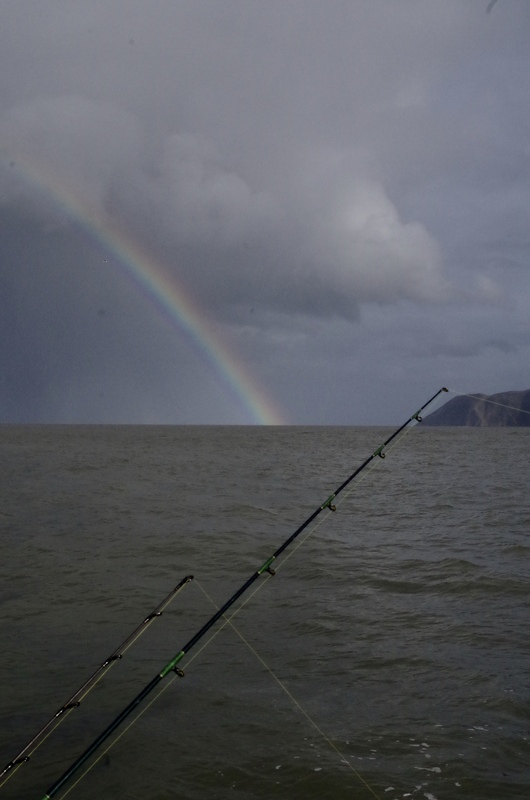 The sun broke through, rods bent and life felt pretty good out there on the water. 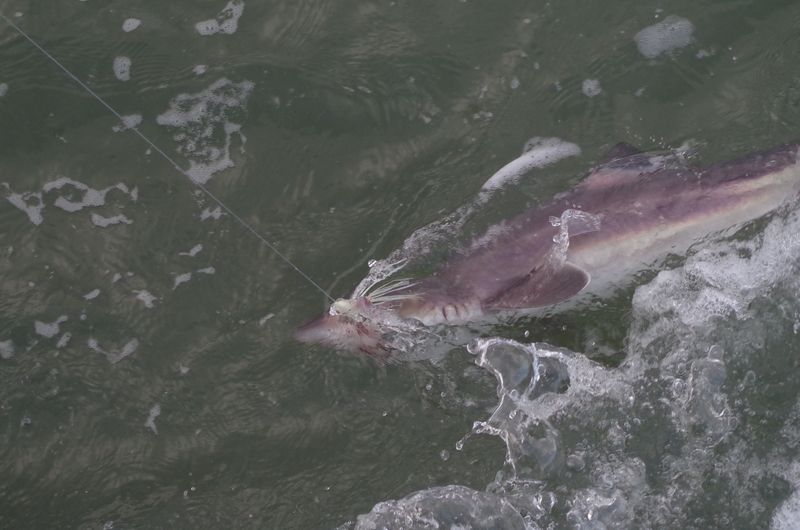 Hectic sport continued until once again the increasing tide pull forced a move to more tranquil waters. 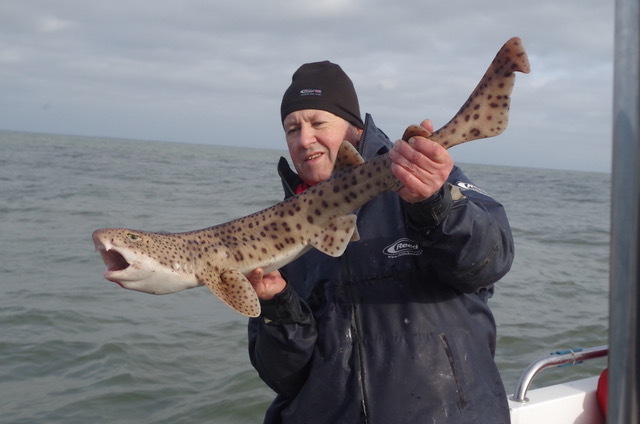 Closer inshore sheltered once again by the towering cliffs we targeted ray on sandy banks. 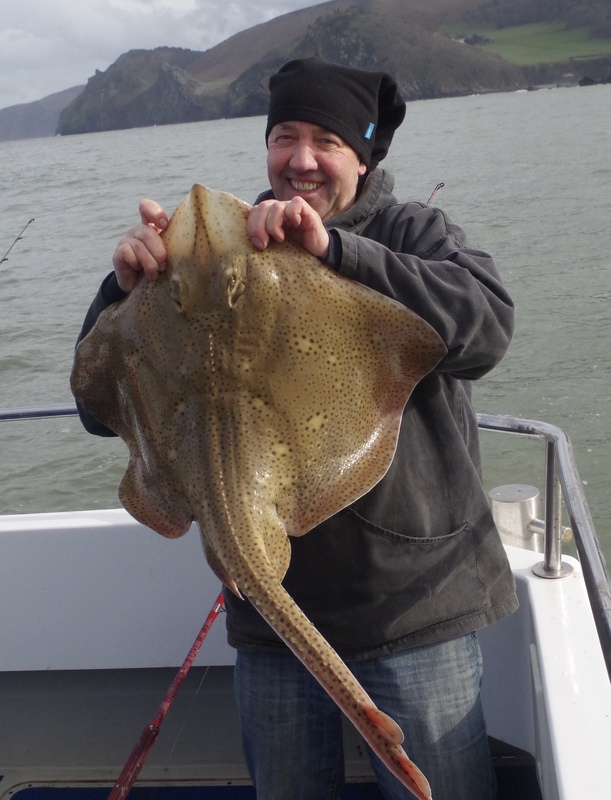 Club secretary Nick Phillips was first into action boating a pleasing small eyed ray that was followed a short while later with a tackle testing blonde ray of 14lb 2oz. 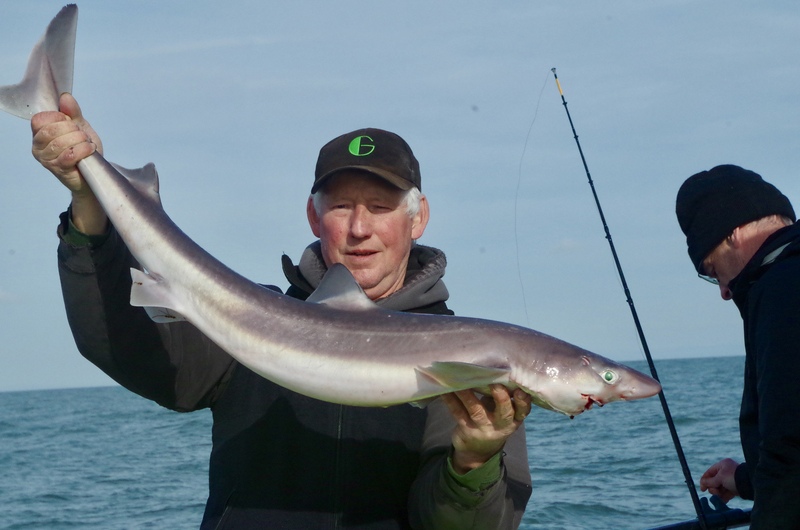 A few conger and the inevitable dogfish followed before we once again headed out to deeper water for a second time rounding off the day with more action landing spurdog to 14lb 8oz. 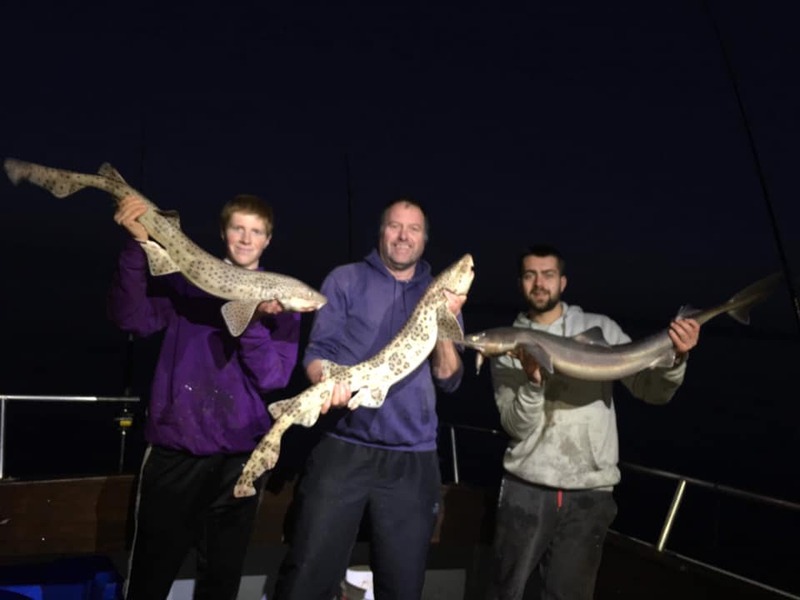 The next couple of months should see spurdog sport continue with every chance of some bigger specimens close to twenty pounds. 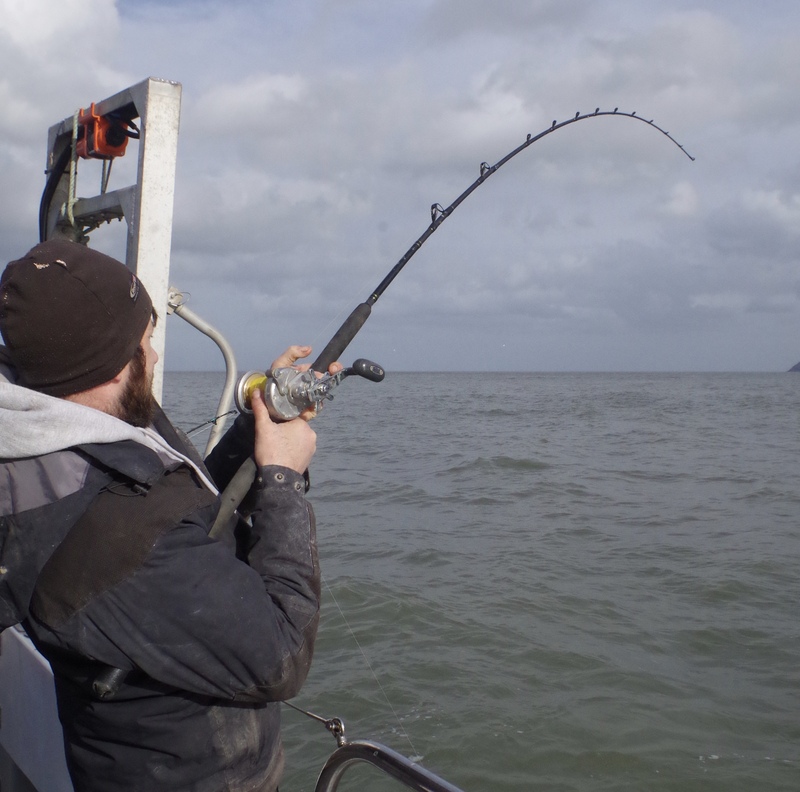 Ilfracombe Charter Boats Wild Frontier 2 ( www.bristolchannelcharters.co.uk) and Bluefin will soon be joined by Reel Deal moving down after the winter season out of Watchet. 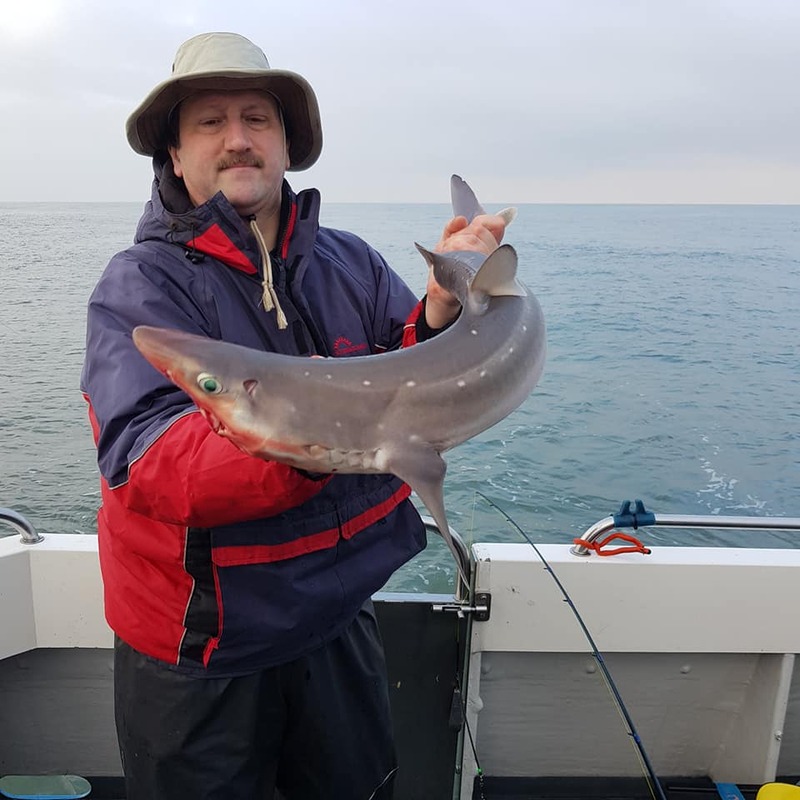 Many thanks to Pete Gregory and Toby Bassett for allowing me to use their pictures and words following a successful trip on Bluefin out of Ilfracombe. 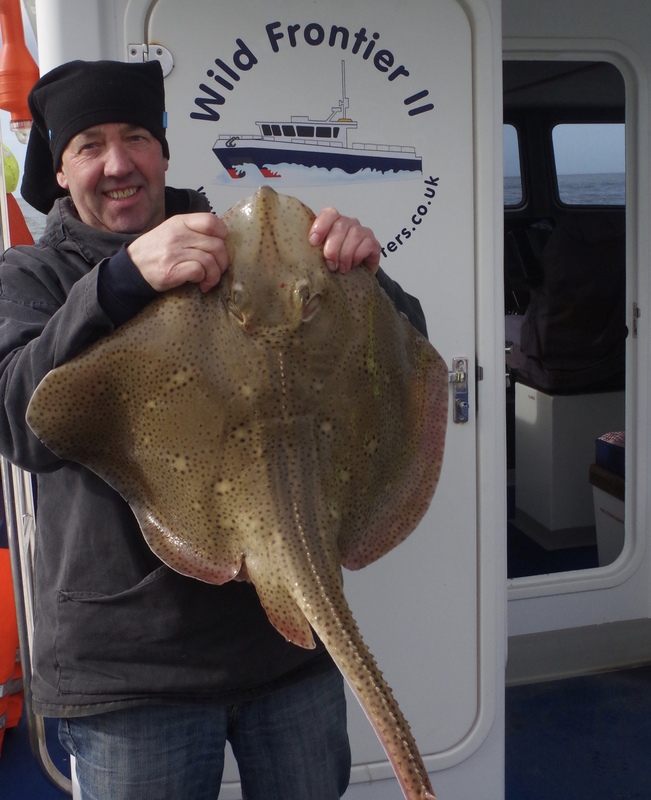 Fishing Ilfracombe aboard John Barbearys boat ” Bluefin ” and what a fish packed day it was . 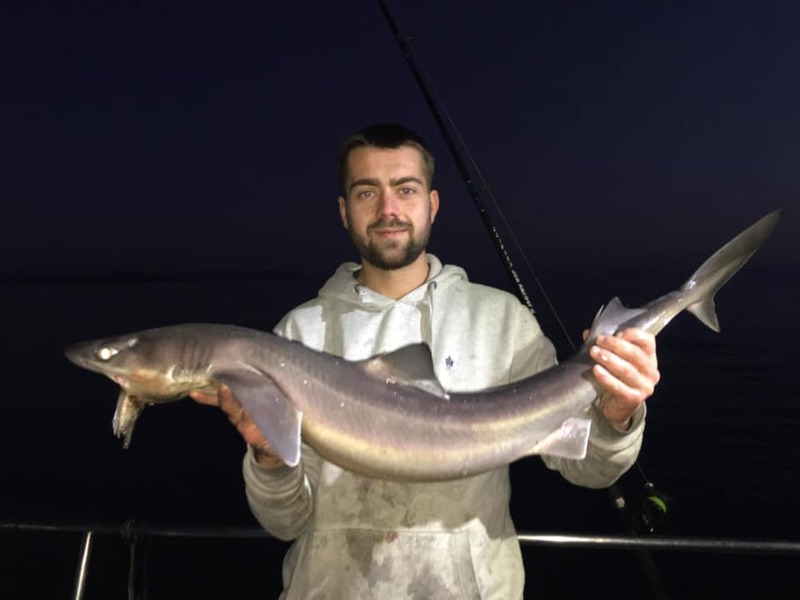 Lots of Dogfish as you would expect but in the morning when your hooking and landing more Bull Huss than dogs , you know its going to be a good day . 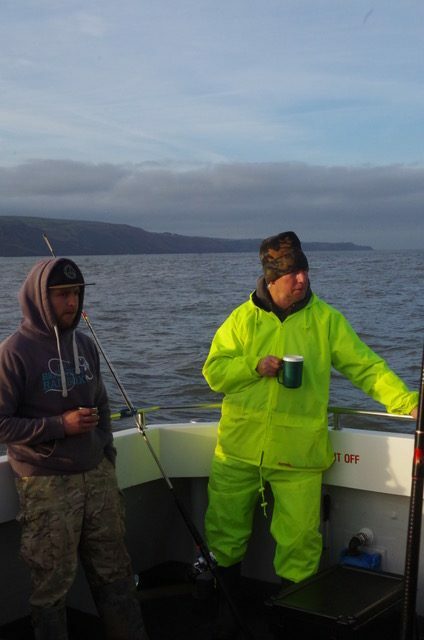 Its always good to fish with Troy and Toby and as well as loads off fish between us , great laughs and banter all day long . 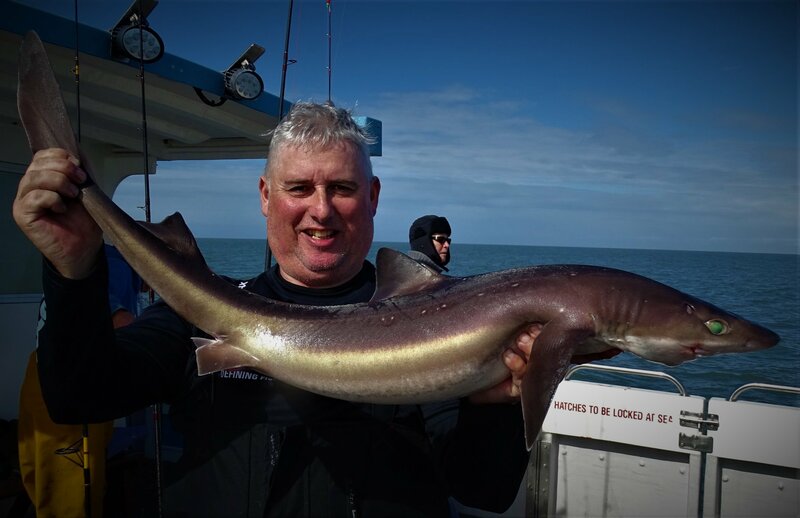 We moved out to deep water to get amongst the Spurdogs and conger and ended up with forty to fifty spurs and a couple of half decent conger . 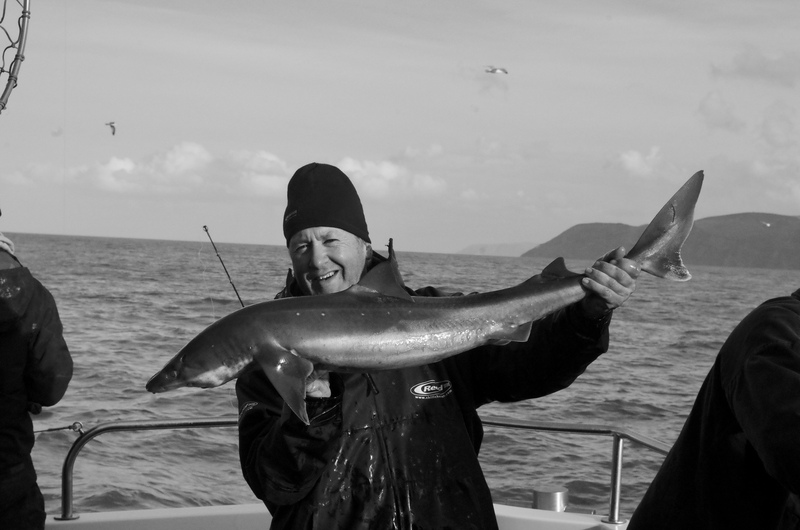 Unfortunately with a spring tide and a little swell we had to head back in , but thanks john and the lads for a good day! 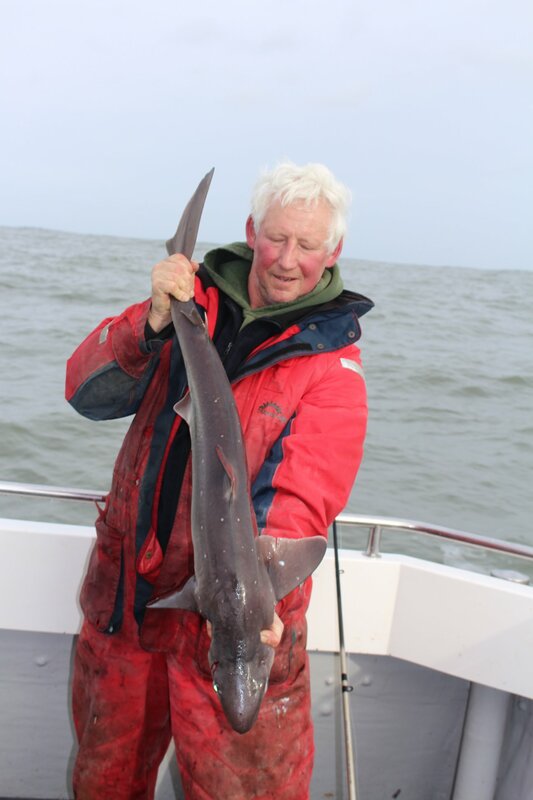 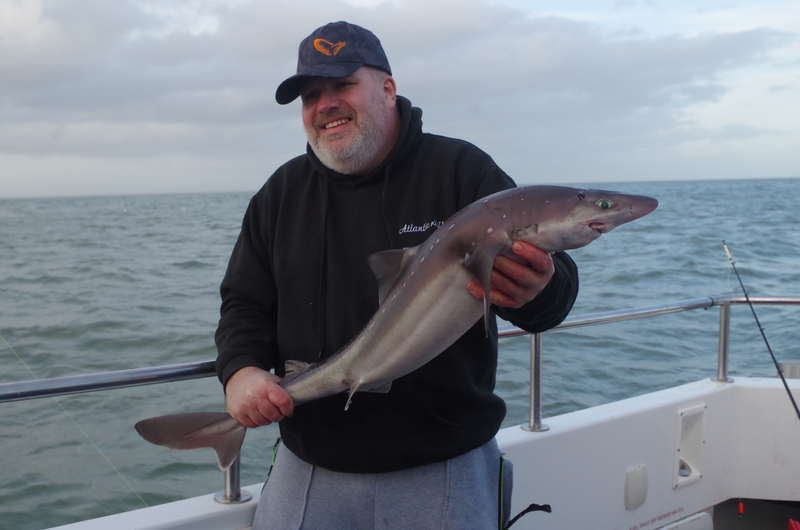 Offshore boat anglers are enjoying some hectic sport with spurdog with a party aboard John Barbeary’s Ilfracombe based Charter boat Bluefin landing over sixty in a trip last weekend. 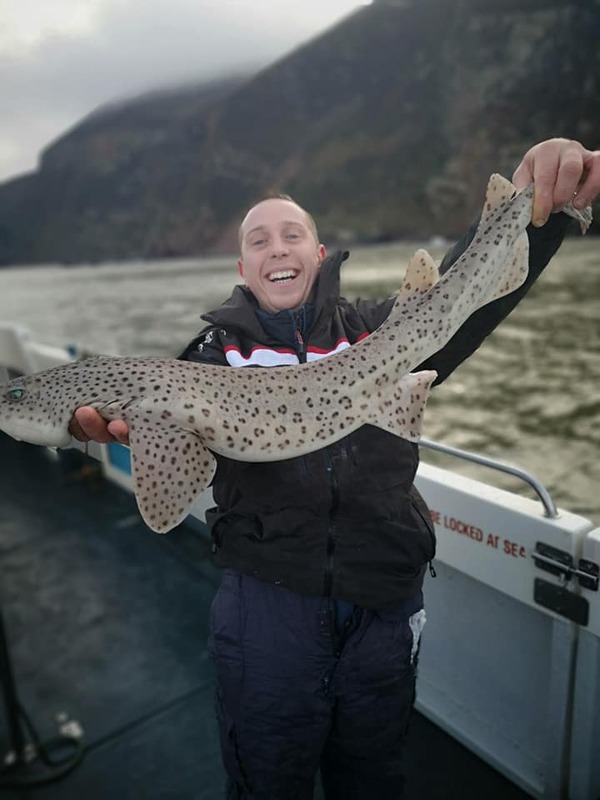 These members of the shark family bring welcome sport each winter with their numbers recovering following the ban on commercial fishing. 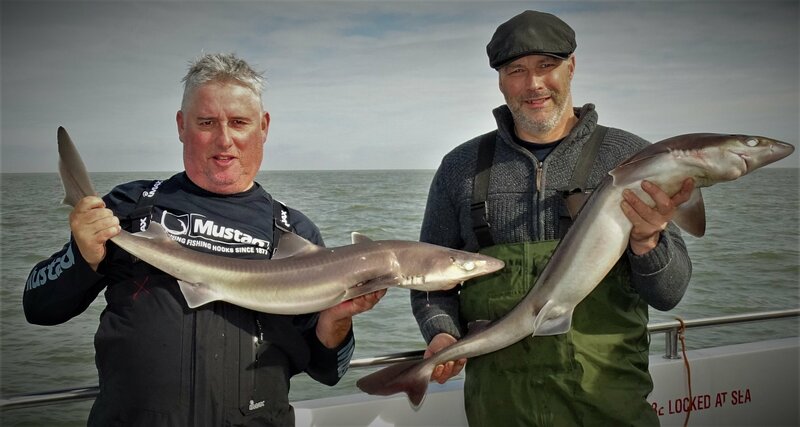 Jon Patten and Kyle Blackmore enjoyed an action packed session landing numerous spurdog, bull huss and bonus whiting. 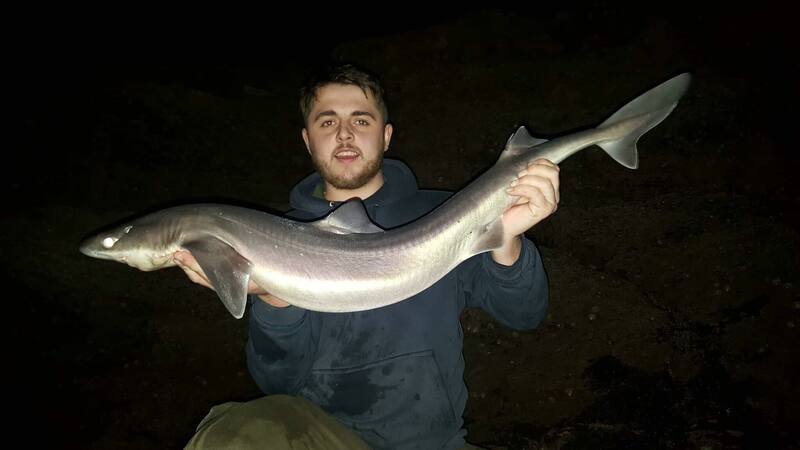 The biggest spur fell to Kyle a personal best of 13lb 8oz. 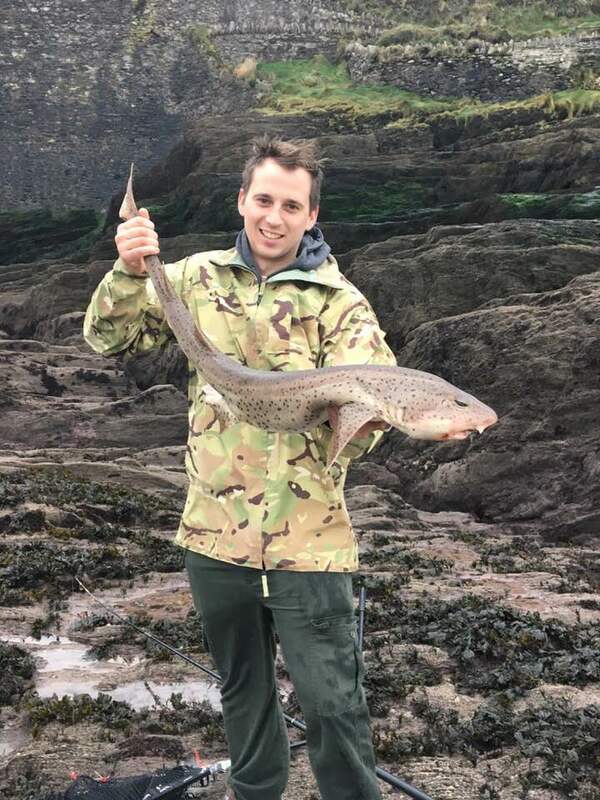 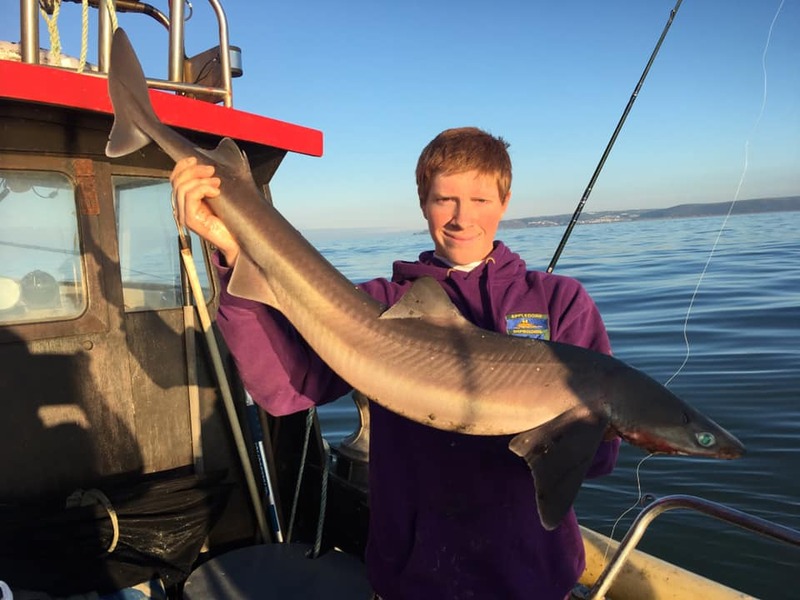 Kody Chugg landed this stunning personal best spurdog of 10lb 12oz during his latest excursion to the North Devon Shoreline. 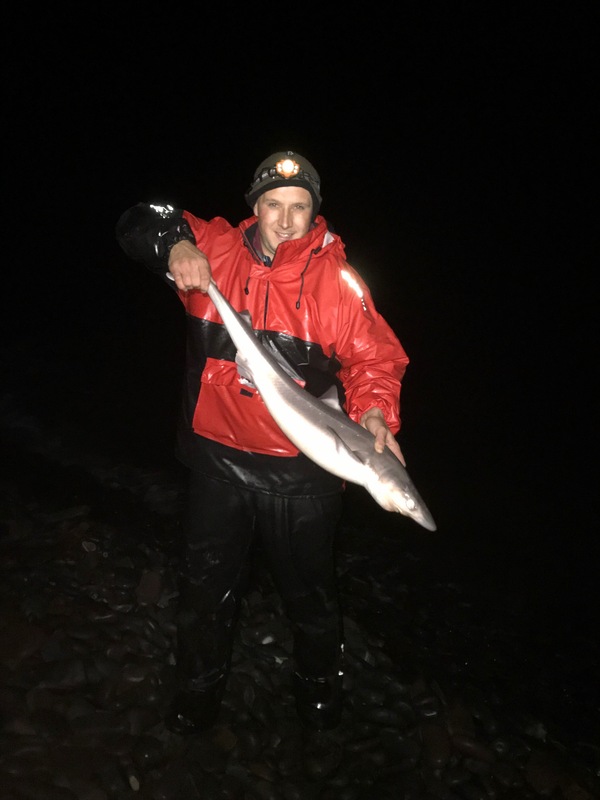 Several other good spurdog have been landed over the past few days and I will try to compile a full report early in the new year. 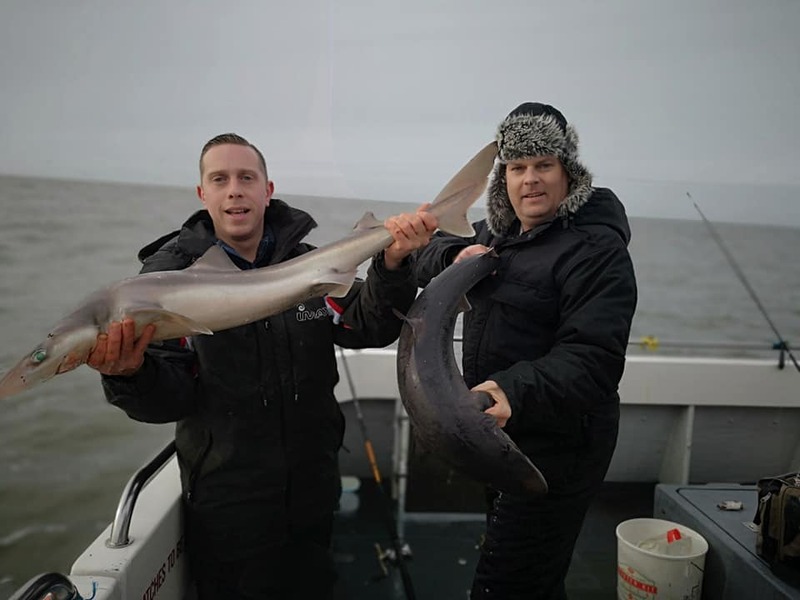 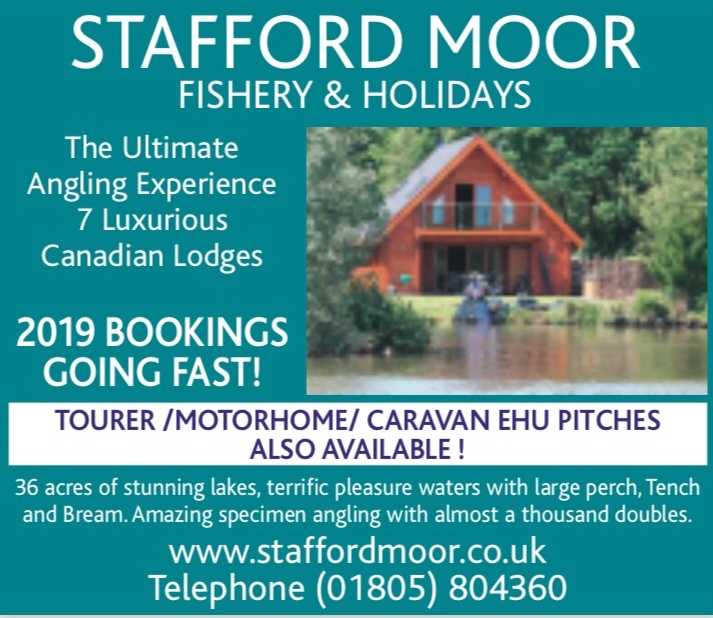 Cameron Atkinson, Thomas Atkinson, James Mayhew and David Atkinson Cracking enjoyed a splendid days boat fishing from a Private boat the boat catching around 50 spurdog with the biggest weighing 15lb to Thomas.Camerons biggest went 14lb 12oz. 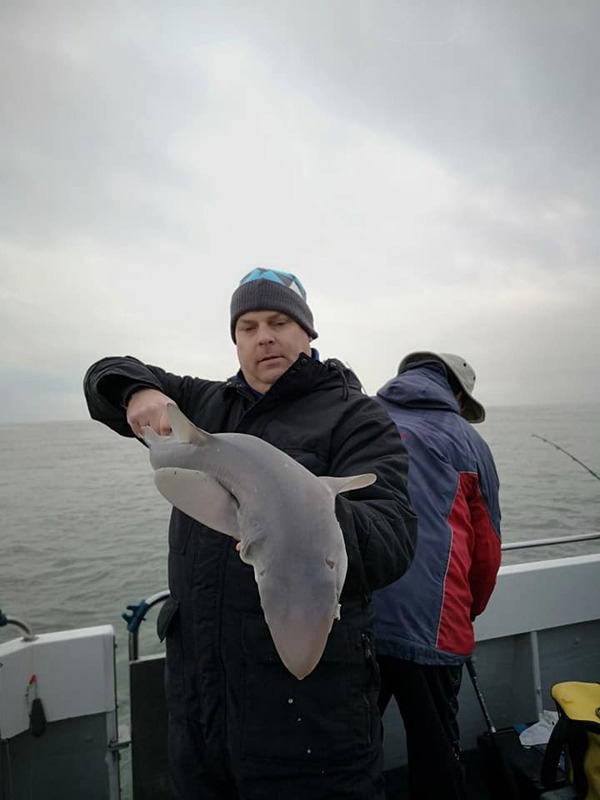 They also had a few decent huss with the biggest weighing 13lb 8oz caught by David Atkinson along with a few eels to around 20lb and a small eyed weighing 5lb 7oz, they also lost a few other decent fish either spitting the bait half way up or on the surface near the boat. 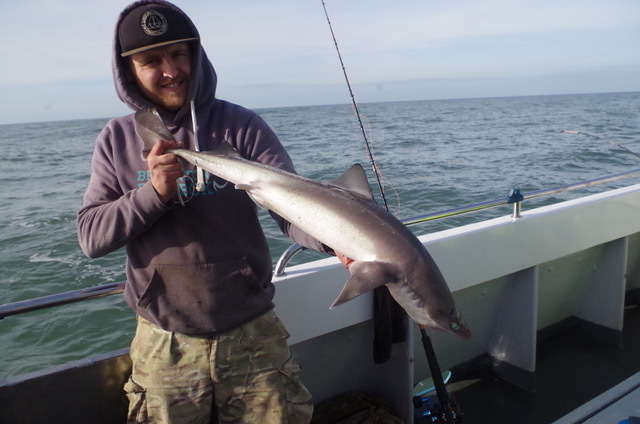 The fish were tempted on a range of fish baits including, mackerel, squid and pouting. 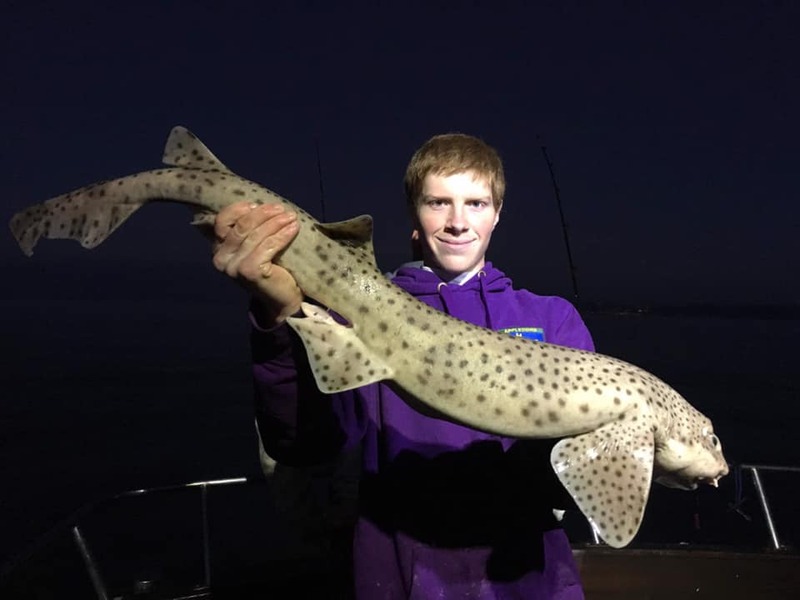 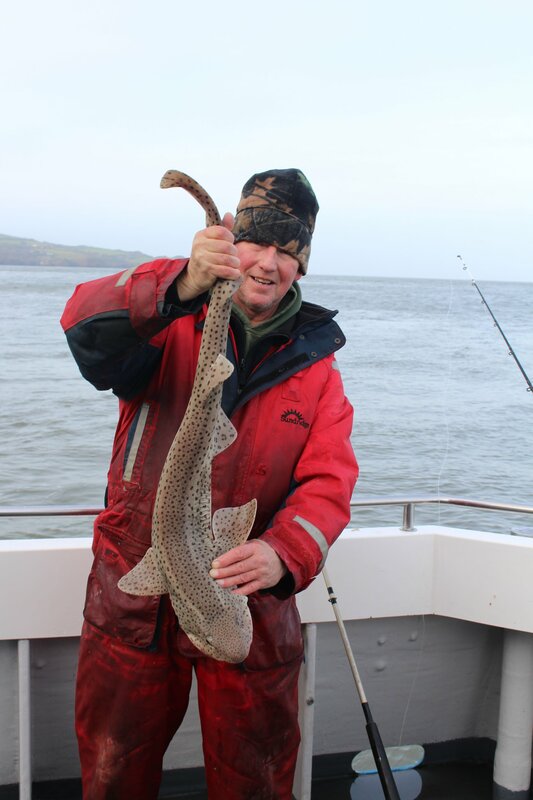 Kyle Blackmore and Andrew Proudfoot headed out onto the North Devon shoreline and earned this brace of spurdog. 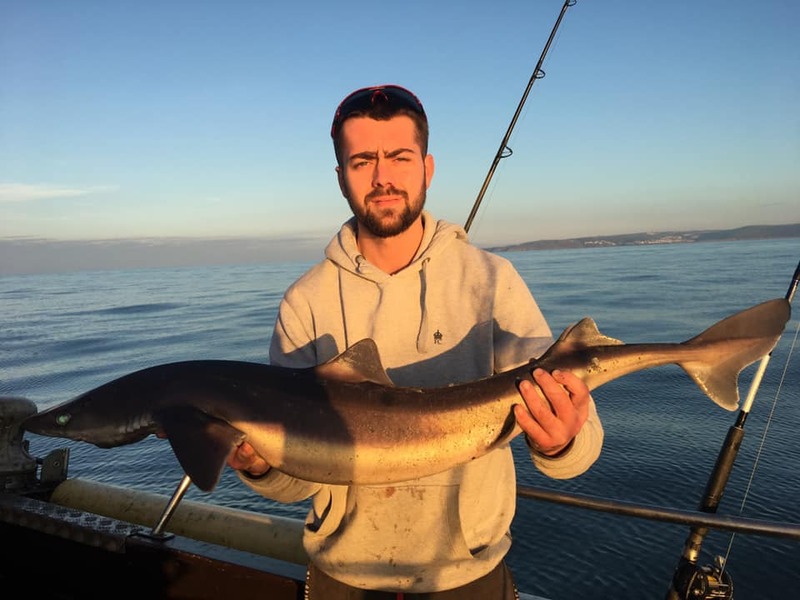 Andrews scaled 11lb 2oz and Kyles 9lb 3oz the fish were tempted using triple sandeel baits. 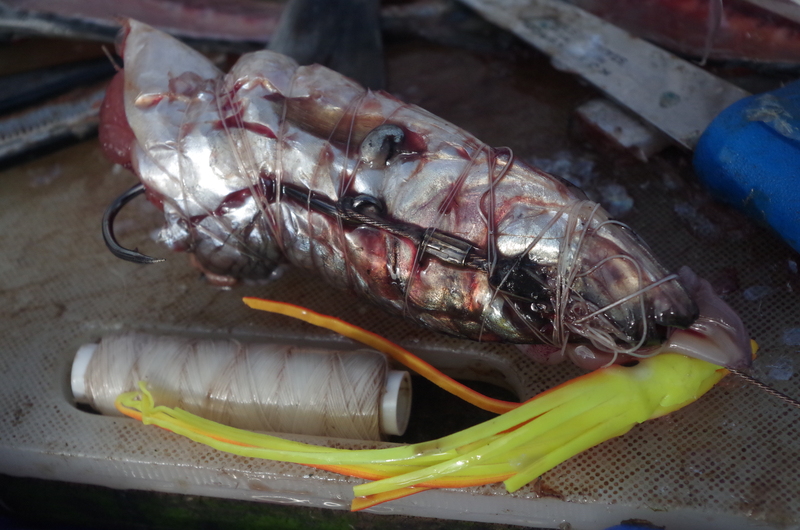 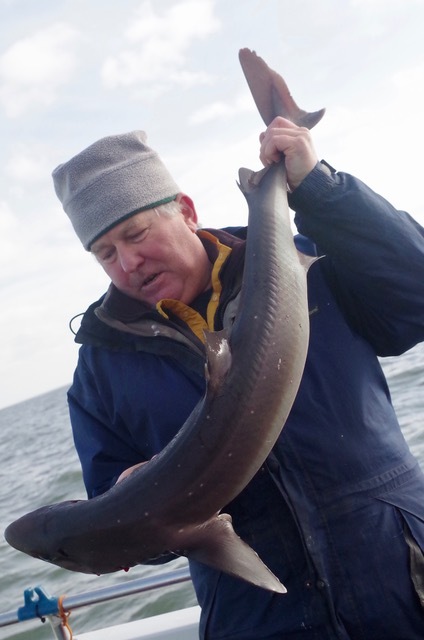 Spurdog can be tempted on a wide range of fish baits presented on a wire trace to combat their fierce dentistry. 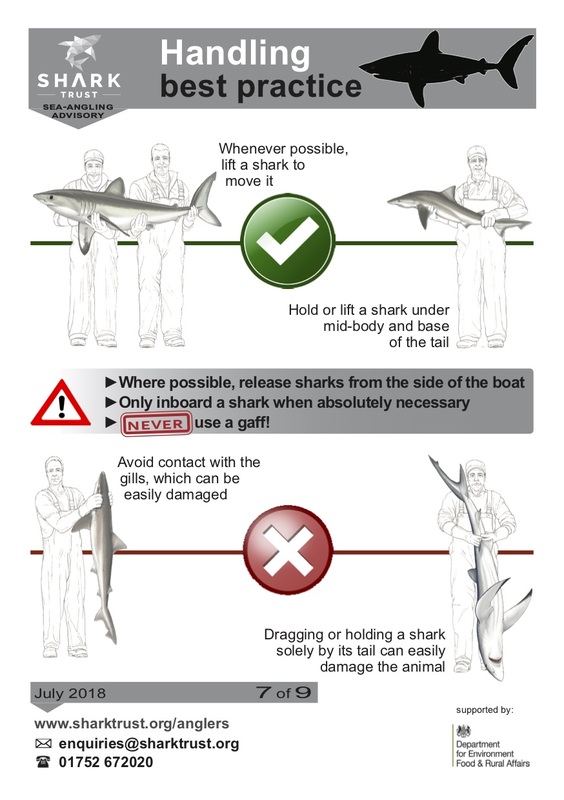 L:ook for deep water adjacent to a decent tide run. 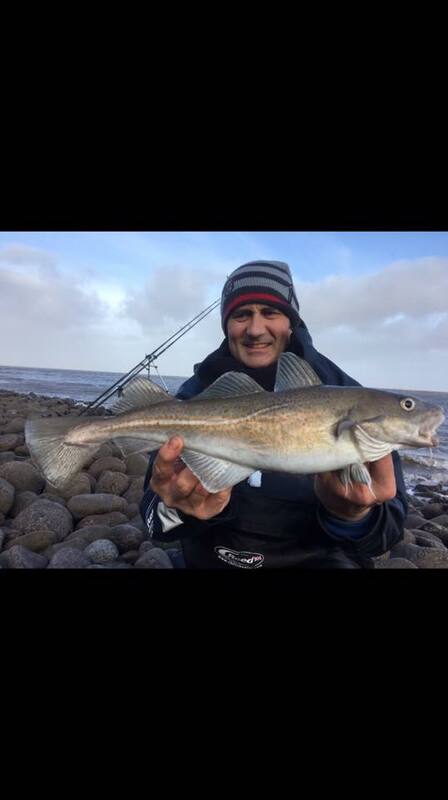 The festive holiday will give many anglers the opportunity to visit the shoreline where there is a variety of species worth targeting. 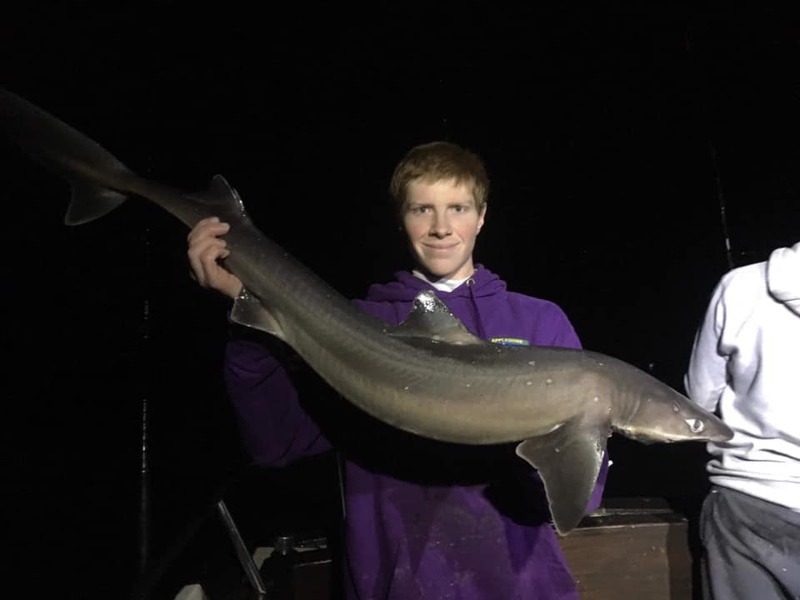 Bull huss,. 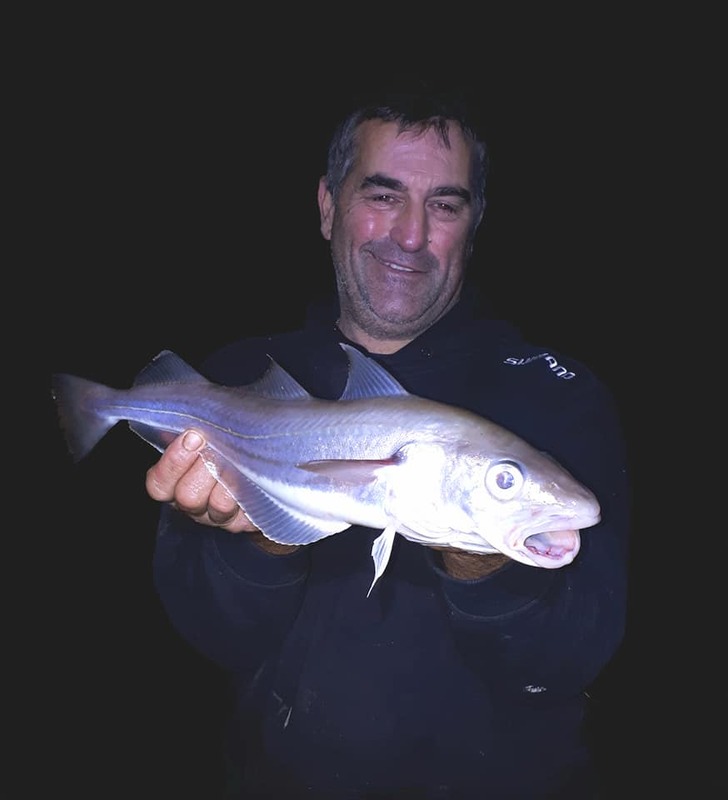 spurdog and tope will be top of the wish list for many with codling also worth targeting epiecially up channel around Minehead and beyond. 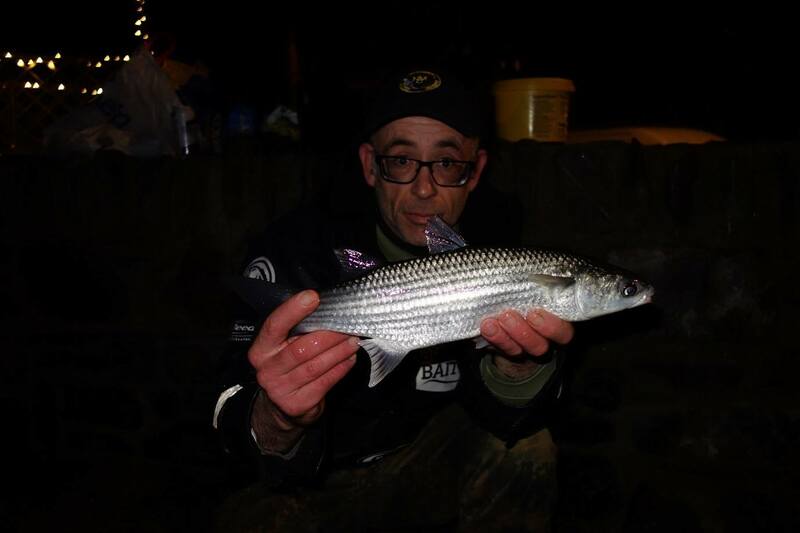 Harbours are well worth a try using light tackle tactics for grey mullet a species that are now present all year around. 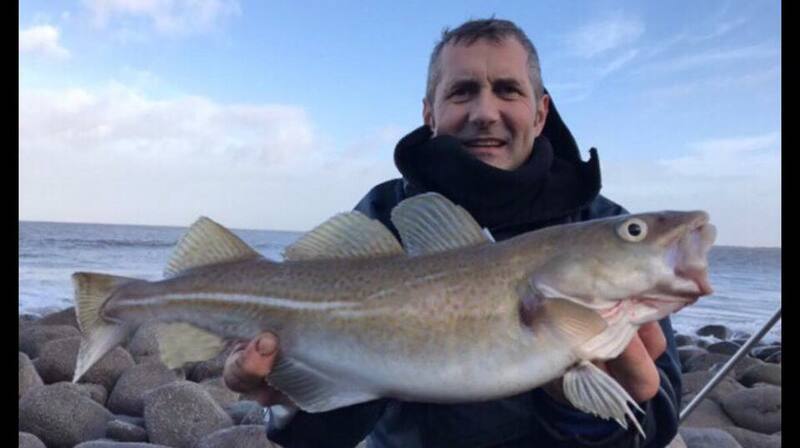 (Above) Shuan Quartly landed this bull huss of 11lb 6oz on recent trip to a North Devon Rock Mark. 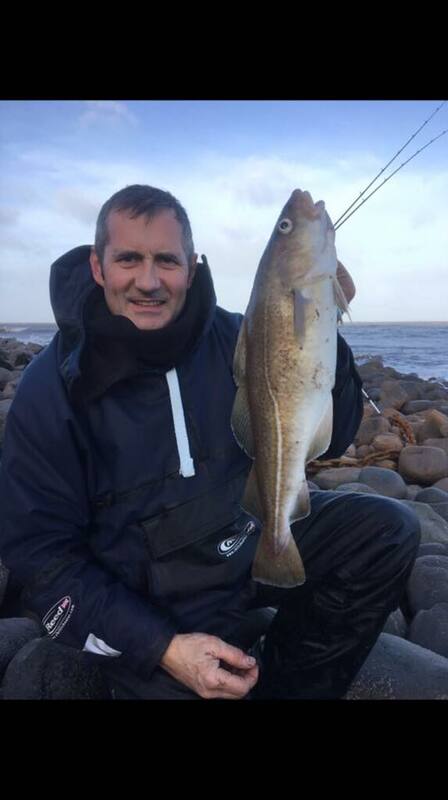 (Above) Mark Jones visited a beach in the Minehead area to land five codling to 4lb in a short session over low water. 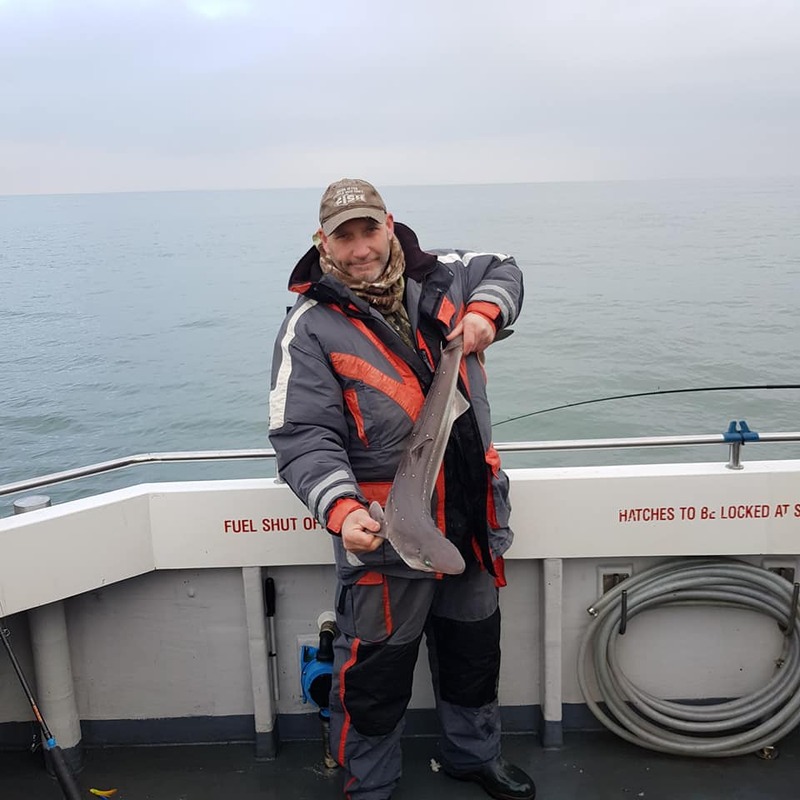 (Above) John Shapland targetted grey mullet with success landing this sliver flanked specimen from a North Devon harbour. 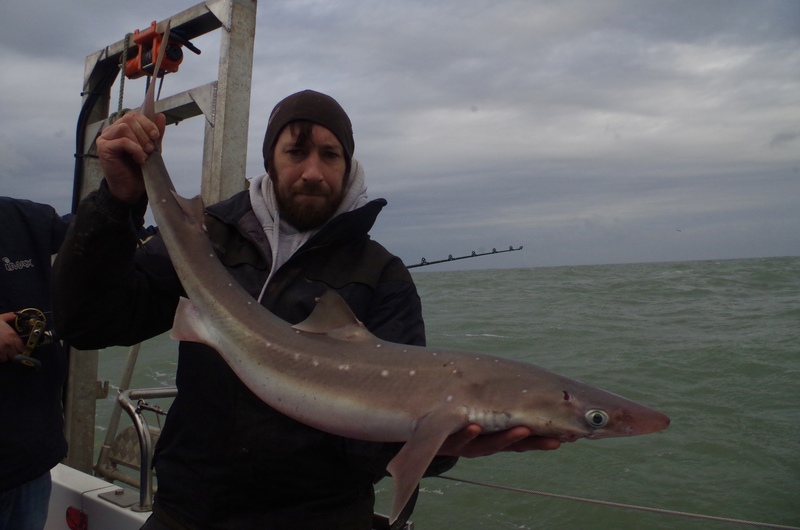 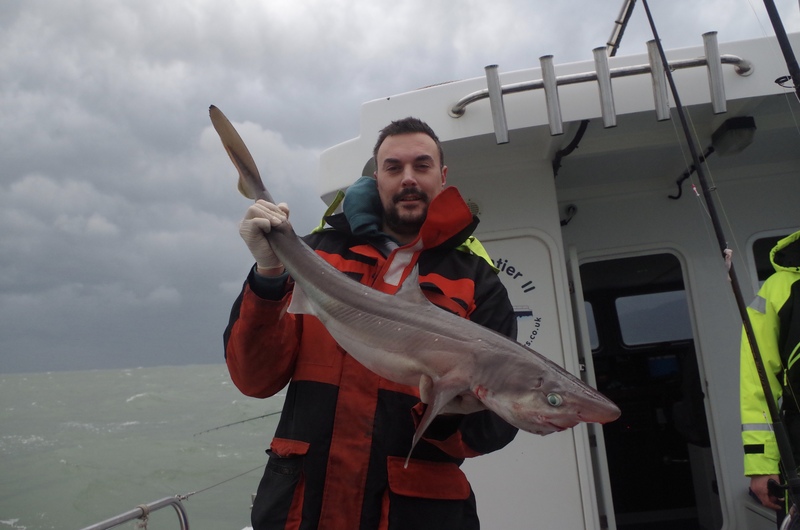 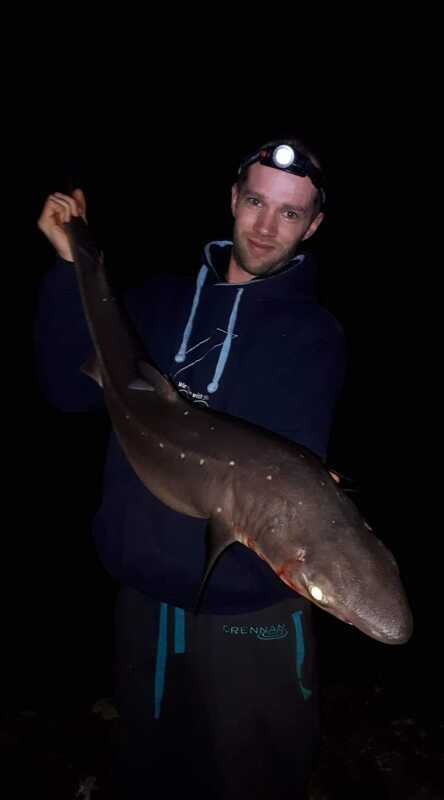 (Above) James Grigg with an 11lb 1oz spurdog caught from a local rock mark on a whole whiting bait.